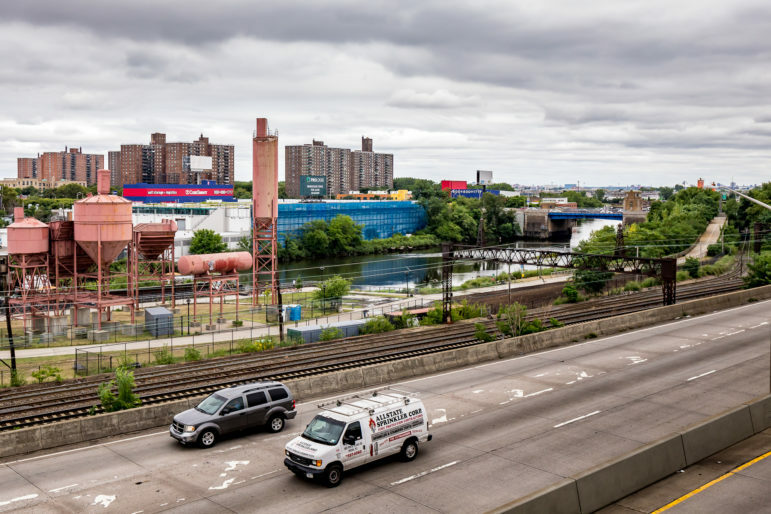 For years, South Bronx community groups have advocated for the conversion of the Sheridan Expressway, an underused Robert Moses-era highway, into a pedestrian-friendly, tree-lined boulevard. The neighborhood would then have access to the Bronx River waterfront, and the conversion would free up public land that could be developed by and for the community, advocates of the plan envisioned. Now that Governor Cuomo has devoted funds to the long-held dream of “boulevardizing” the Sheridan, residents are excited for the anticipated changes. Yet as details of the state’s exact designs for the project have emerged in recent months, some community members—especially those involved in the South Bronx River Watershed Alliance, a coalition of seven groups that has been campaigning for the conversion for over a decade—have expressed disappointment with some of the details. They say that the governor’s plan does not go far enough to realize earlier community visions, and are pointing out the differences between the state’s plan and earlier ones, including SBRWA’s 2009 plan and one crafted in response by the Department of City Planning in 2013, which SBRWA members support. Those earlier plans are still relevant today. The Department of City Planning’s current Southern Boulevard Neighborhood Study, one of the ten neighborhood rezoning studies launched as part of the mayor’s affordable housing program, is intended to build off its 2013 planning effort. The study includes the wider neighborhood surrounding Southern Boulevard and it’s not known—or, the city says, yet decided—to what extent and where the city will introduce a rezoning to the area, but it’s clear the city is definitely interested in redeveloping the areas adjacent to the Sheridan. The state has divided its initiative into two parts. The first is the “Arthur Sheridan Enhancement Project,” a $96 million initiative to make the Sheridan easier and safer to cross. The project entails renovating the expressway and adjacent roads to include three pedestrian crosswalks, a bike lane, sidewalks, a bridge within Starlight Park, traffic lights at intersections, and tree plantings, among other improvements. While some changes will be made to the adjacent roads, overall the effort will maintain the same number of lanes and the same overall width of the roads. Construction is slated to begin in fall of 2018 and finished in the fall of 2019. The second part, the “Hunts Point Interstate Access Improvement Project” addresses long-held community concerns about truck traffic traversing local neighborhood streets toward the food distribution center in Hunts Point. The project entails the renovation of the Bruckner Expressway with new ramps to facilitate better access to the distribution center, to be completed by 2025 and with a price tag of at least $1.7 billion. So far, the state has held one meeting for each part of the initiatives to explain their plans and obtain neighborhood feedback—and residents certainly have critiques, both about the engagement process and about the design. They are glad, however, that negotiations are at least underway. “It’s almost there. I think there are some improvements that would make it better,” said Angela Tovar of the Point Community Development Corporation at a meeting on Monday night on the Sheridan project. Yet she said that community residents have been invested for too long for the project to fail to meet expectations. “We want to see the right thing happen,” she says. SBRWA members are concerned that the project’s segmentation into two parts will hinder community engagement as well as result in bad planning that fails to consider how the design of one project may interfere with the goals of the other. For instance, as part of the Hunts Point Interstate project, the state is considering building a ramp on Edgewater Street to help direct traffic to Hunts Point. Tovar is concerned this option would interfere with residents’ access to waterfront parks, particularly Point CDC’s waterfront campus. Improving waterfront access is one the objectives of the Sheridan Enhancement project. Vincent Pellecchia of the Tri-State Transportation Campaign points out that as part of the Sheridan Enhancement project, the state intends to provide an extra lane on the southbound Westchester Avenue exit ramp to improve access on and off the Sheridan. Pellecchia questions whether this is necessary, especially considering the new ramps that will be added through the Hunts Point Interstate project. In contrast, the Department of City Planning’s 2013 plan recommended closing the southbound Westchester avenue ramp, and proposed a ramp at another location, not Edgewater Street. The state is also looking at the city’s proposed location for the ramp, but says it would cost a much higher $2.6 billion, though community groups dispute this high cost estimation. SBRWA members are concerned that after years of community visioning, the state will rush to implement its own plan without enough community consultation. They were disappointed that the state only gave one week’s notice for an important meeting on the environmental review process for the Hunts Point Interstate project, and want the formal comment period extended beyond the current end date of July 27. And they are concerned that the state will not be creating an environmental impact statement for the expressway boulevardization; the state has deemed the changes not significant enough to warrant environmental review. Harold Fink of the state Department of Transportation says that the two efforts are being conducted separately because they have different objectives. Though there will be no environmental impact statement for the Sheridan project, an environmental analysis will still be conducted and incorporated into a Design Approval Document for the project. In addition, in recognition of community concerns about waterfront access around the Edgewater Street ramp, Fink says the state has developed, and may soon unveil, solutions to provide better pedestrian access to the waterfront parks without changing the ramp’s proposed location. He also notes that further changes could always be made to the design, such as returning the Westchester Avenue ramp to a single-lane or closing it, if the community decided that there was enough access to the road. At an open house on Monday night for the Sheridan Enhancement project, one local stakeholder recommended the state incorporate natural flood infrastructure, like bioswales into the design. Argelia Ortiz, a member of the community advocacy group We Stay/Nos Quedamos, recommended additional improvements such as investments in the city-owned bridge at 174th Street and in Starlight Park. A member of the Teamsters union, representing commercial garbage workers in Hunts Point, said the changes looked great and would help deal with the time-consuming traffic jams on local streets. “Let’s just hope it doesn’t open the gates to gentrification,” he says, noting the way rents have already begun to rise in the surrounding area. Advocates’ biggest concern with the state’s current design, however, is that the Sheridan will remain the same size. Mainly, advocates are concerned that at this width, the boulevard will still remain a barrier, and be unsafe, to pedestrians. Nelson Beltran of Transportation Alternatives, noting the highway’s low ridership levels, would like to see fewer car lanes so that space could be created for an additional bikelanes. In addition, some SBRWA members note that originally, their community vision and the 2013 city proposal envisioned narrowing the roadway as part of a larger plan to transform the surrounding area. Currently, the expressway and adjacent roads are 210 feet wide. To the east, abutting the Bronx River, lies privately-owned industrial land, including some auto-motive businesses, a hotel and parking lot, among other uses, at a width of about 180 feet. The city’s 2013 plan envisioned consolidating all the roads to 115 feet, and using the expanded footage, along with a rezoning, to enable housing and commercial development, plus a public greenway along the waterfront, in place of the industrial land. The impact of a rezoning could be very different depending on the state’s actions. If the roads are kept at their original width and the industrial areas are rezoned, the city would have few tools to control the development of those private properties. If, however, the highway were narrowed, that would free up public land. To gain control of the waterfront, the city could use eminent domain to obtain the private industrial parcels. The city could also try to work with those private owners, letting them expand their properties into the public land freed up by the Sheridan in exchange for providing waterfront access and affordable housing. The 2006 SBRWA plan specifically envisions the city retaining land in the public domain to ensure the creation of permanently affordable housing. Fink of the State Department of Transportation says the state is aware of residents’ concerns about the width of the road and is therefore incorporating “bulb-outs” in the design—sidewalk extensions at the crosswalks. He also raises one concern with the 2013 city plan: by consolidating the streets to the east and west with the Sheridan itself, it would mean the new residential complexes on the west side would directly abut the boulevard. But the greater problem, he says, is that it’s not within his agency’s powers to rezone the land to the east of the highway. Narrowing the boulevard would free up land, he says, which would make the project a much more complex economic development initiative requiring the city to sponsor a rezoning. It’s not the first time that the state has pushed for highway renovations to improve traffic patterns, while locals have pushed for a more extensive transformation of the existing land uses in the area. The difference then, of course, is that now the city does have a land use plan, the 2013 City Planning one—but it’s unclear whether the state and city will be working together to complete it. Asked to comment on the state’s plan, Rachaele Raynoff, a spokesperson for the Department of City Planning, said in an e-mail that the city remains “in active discussion” with the state and city transportation agencies. A rezoning of these industrial areas is certainly on the table. In June, Salamanca told the Hunts Point Express that the city was definitely considering rezoning the industrial area around the Sheridan Expressway, as well as exploring the possibility of rezoning other small parts of the neighborhood, though the Department of City Planning says no decisions have yet been made about a rezoning strategy. See the city’s one-page brief about Southern Boulevard here and the project website here. While the entire study is controversial, there seems to be more support, if also cautious, for rezoning the industrial corridor next to the Sheridan. Salamanca says he would be “all for that,” while David Shuffler, director of Youth Ministries for Peace and Justice, is also optimistic for that part of the study. “What I really like about the Southern Boulevard rezoning [study] is that it’s going to look at the waterfront,” says Shuffler. He says redevelopment of the underused industrial parcels by the waterfront could help bring more jobs and community facilities to the neighborhood, though he acknowledges that it will be somewhat challenging to control development, especially if all the land is private. And he notes that he’s not making a comment about rezoning the rest of the neighborhood—where he knows many people have concerns about displacement. Tovar of the Point CDC is even more circumspect. “We definitely see the opportunity to advance more public benefits like public housing on publicly owned land, and I think we would be open to supporting that, but we can’t support anything that’s going to result in the displacement of people in the community, so we would have to be really careful in endorsing anything before a plan was presented to us,” she says. Concerns that a rezoning could lead to displacement—and that the city is not being transparent enough about its intentions—continue to abound. In June, Salamanca and city agencies invited just the directors of several nonprofit housing organizations and community groups, including Banana Kelly CIA, Inc., and the Point Community Development Corporation, among others, to describe their concerns. As reported by the Hunts Point Express, members of Banana Kelly, as well as the Pan-African Community Development Initiative, Picture the Homeless, and Take Back the Bronx held a protest outside the meeting, to denounce the potential rezoning and that the meeting was not open to the public. Over the next few months, stakeholders are encouraged to submit comments on the Sheridan’s future design to Sheridan@dot.ny.gov or to the Arthur Sheridan Project Team, 47-40 21st Street, Long Island, NY, 11101. Comments on the Hunts Point Interstate Access Improvement project should be e-mailed by Thursday July 27 to HuntsPoint@dot.ny.gov, or by snail mail to the NYSDOT Hunts Point Project Team at 47-40 21st Street. Also stay tuned for the first public meeting of the Southern Boulevard study sometime in the fall. Ultimately the NYSDOT and Cuomo will determine what happens to the Sheridan Expressway (I-895). Put enough demands on the NYSDOT and they may change their mind and leave the Sheridan in place. The City Planning Commission approved the city’s proposal to redevelop a bus depot on 126th Street into a memorial and mixed-use housing complex. The forum in the 8th district suggested the race is among three Democrats with different degrees of alignment with the current Council member, Speaker Melissa Mark-Viverito.